Where’s the Best Pizza in New Orleans? It’s like pizza. Even when it’s bad, it’s still really good! New Orleans is probably (definitely) the best food city in the world. While you may think first about shrimp and grits or a roast beef poboy, the great thing about NOLA food is…it’s ALL good. Heck, a hot dog on Bourbon Street can taste like the greatest thing you’ve ever tried! This certainly goes for pizza in the Crescent City, and while we’ve never met a slice we wouldn’t eat, some are simply better than others. Get your Parmesan and red pepper flakes ready, today we’re on the hunt for the best pizza in New Orleans! This list is in no order, but we can guarantee delicious results if pizza is eaten in this order. Ok, let’s be honest. Any order works. Pizza is amazing. Enjoy! The Uptown spinoff of Domenica downtown brings the same level of quality Italian flavors. 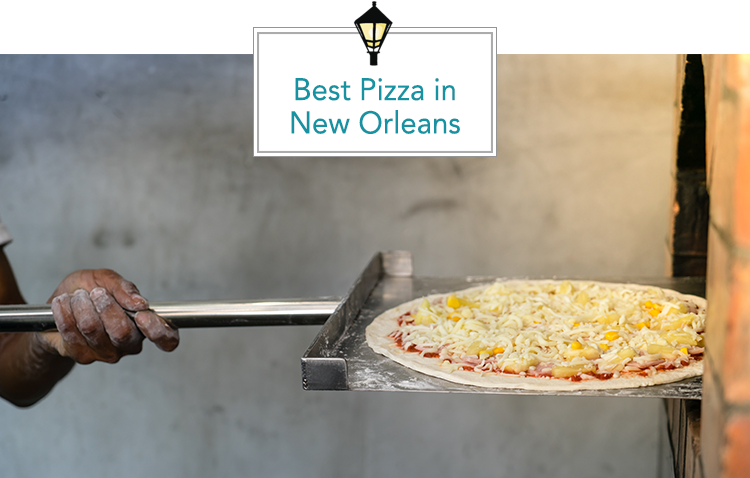 Their wood-fired pizza is amazing, and you’ll love their weekday happy hour: half-off pizza, draft beer and wine by the glass every Monday – Friday 3 – 5 p.m.
Boasting a shelf full of awards (Voted Best Pizza by Nola.com and Eater), Pizza Delicious has to be on any New Orleans Pizza list. If you’re in the Marigny/Bywater area, they’ll bike deliver this cheesy goodness every night until 9:45 and everywhere else on Saturday and Sunday from 11 a.m. – 9:45 p.m.! For dine-in, pick up or delivery, you can get amazing pizza in small and large sizes, by the slice, and you can even build your own calzone! Coming off of a win for Best Pizza in the 2017 Gambit reader, Theo’s has four area locations to serve its loyal customers. There are lunch, beer and wine specials each week and delivery is available on WAITR! Snag a Freret Jet Lunch special ($9.95 your choice of salads and all you care to eat pizza) every Monday – Friday from 11:30 – 2:00. Dine-in, carryout or delivery. Slice offers some of the freshest ingredients around for their massive pies, salads and delicious apps. This may be your most authentic Italian pizza experience in New Orleans. Their unique dough takes three days to prepare and the result is pure Neapolitan bliss. Ancora also offers wines entirely from the Campania region of Southern Italy, the birthplace of pizza. One of the coolest locales on this list, Paladar is a super hip, California-inspired spot in the Marigny neighborhood. If you like a bit more ambitious pizza menu, this is your spot! Probably the newcomer to the list, Echo is the latest of our city’s amazing wood-fired pizza spots. From classics like the Margherita to adventurous options like the Miso with Roasted Onions, Mushrooms, Lemon, there’s something for every pizza palate. Plus, they have some tasty cocktails!